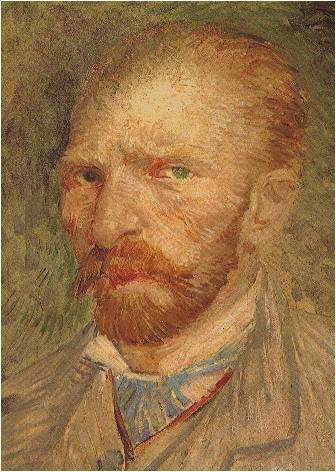 Remember Vincent Van Gogh's self portrait? We learned about this in the first few days of art history class. It is a clear representation of how Van Gogh painted, but more importantly we get to see a rare picture of the artist up close and personal. I wonder, if you had a chance to paint your own self portrait, what might it look like? Better yet, what might it look like if God painted it for you? The importance of the verse has more to do with how God really sees us than how we see ourselves, but what might it look like if we really saw ourselves the way we are. Today's view of Christianity is often accompanied with comments like, "We're All Sinners, Saved By Grace," however true, aligns all God's followers under one banner of sin. Sure, I agree we are sinners saved by Grace, but once we are saved, it's over. Collectively if we see ourselves as sinners, then we begin identifying with the sinful mistakes in our lives. We tend to see the world as a "half empty" condition, rather than how God really sees our make up. If we think a relationship in our past dictated by betrayal, hurt, anger, and all sorts of awful, then it's easy to think all the rest of our relationships will turn out that way. But what if we had the chance to live in the light of God's view? The Realism of who we are is quite apparent as He invites us to be adopted sons and daughters. He creates a newness at the core of our being, so that; we can stand before Him, and the world, in a NEW WAY!! Today, I invite you to see yourself, not as a sinner; but as those people who have decided to allow the umbrella of God's grace to cover you, AND to transform you! !